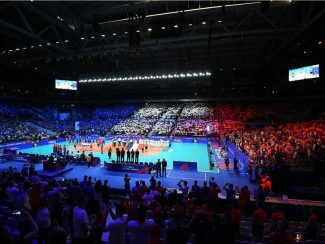 Lausanne, Switzerland, April 4, 2019 – The full and detailed schedule of the 2019 FIVB Volleyball Nations has been officially released Thursday, as the second edition of the competition approaches. First service will be in the women’s competition on the shores of the river Danube at 14:00 GMT (17:00 local time) on May 21, when defending champions USA take on Belgium in the Bulgarian city of Ruse. 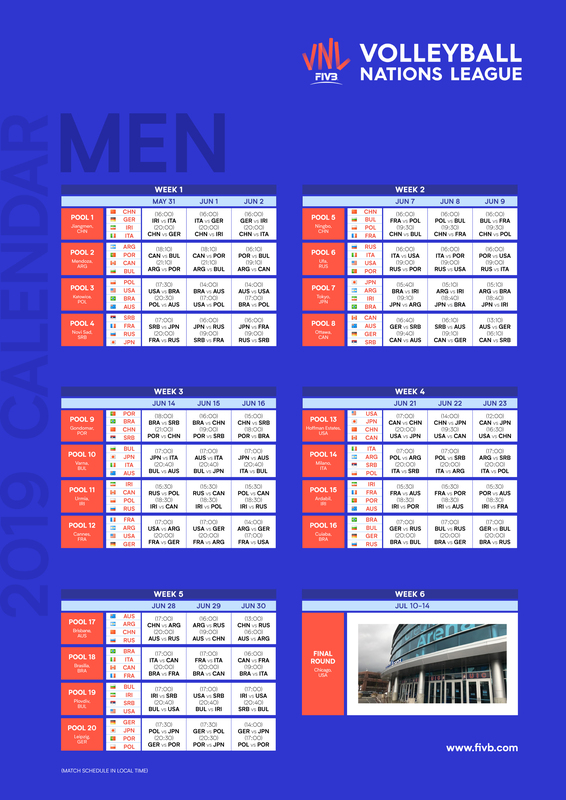 The men’s competition starts ten days later, with first serve at 08:00 GMT (16:00 local time) when Italy face Iran in the Chinese city of Jiangmen on May 31. 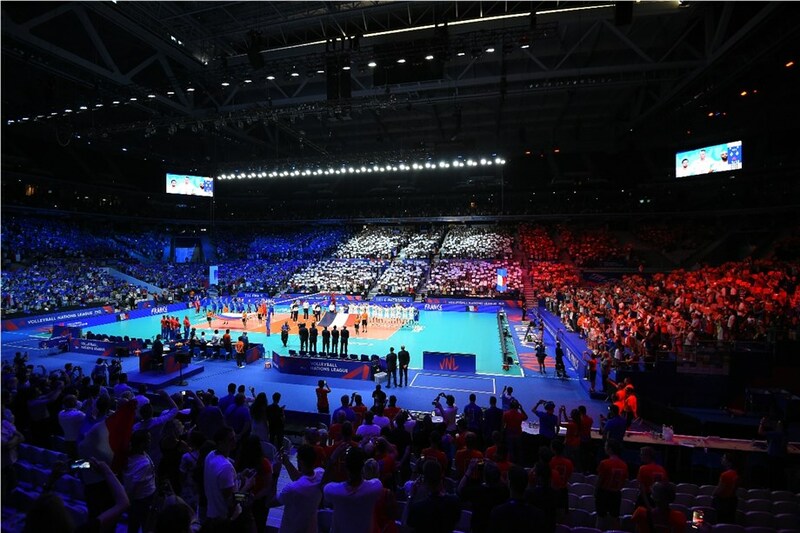 But focus on the opening day of the women’s competitions will surely be on the Serbia v the Netherlands game in Belgrade, a rematch of the 2018 FIVB World Championship semifinal (in which the Balkan side prevailed in four sets). The Belgrade pool also features last year’s VNL finalists Turkey, alongside Korea. Poland host Italy, together with Thailand and Germany, in Opole. And Brazil entertain Russia, China and the Dominican Republic. 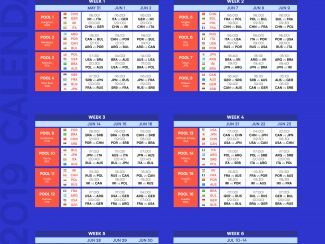 Aside from USA and Belgium, the Ruse pool also features Japan and VNL rookies Bulgaria. 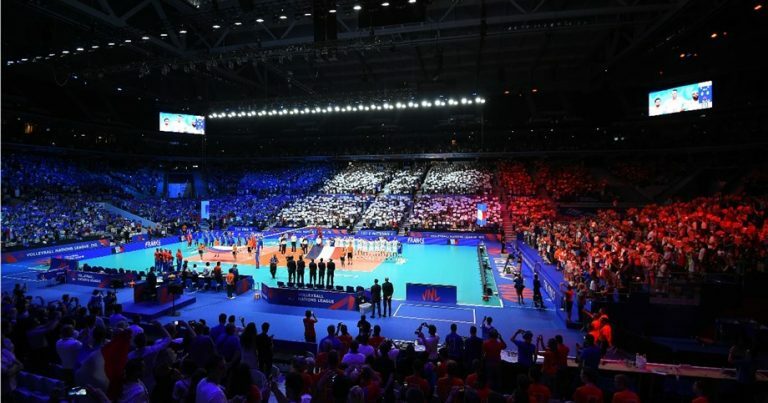 The men’s competition also opens with a bang, when defending champions Russia take on France at Novi Sad in a rematch of the 2018 VNL final (which Russia convincingly won in straight sets at Lille). The opening weekend has yet another huge match lined up, when Poland and Brazil clash at Katowice on June 2 in a rematch of the 2018 FIVB World Championship final (which the Europeans won in straight sets at Turin). The Jiangmen pool also features hosts China and Germany, while in Katowice USA and Australia complete the lineup. And in Novi Sad, Serbia host Japan alongside Russia and France. Elsewhere on the opening weekend of the men’s VNL, Argentina host Canada, Bulgaria and newly-promoted Portugal in Mendoza. The women’s VNL preliminary round runs for five weeks, until June 20, ahead of the Final Six scheduled from July 3-7 in Nanjing. The men’s competition also features five weekends, wrapping up on June 30, before the top six teams move to Chicago for the finals.